Inka Johnson, Engineering World Health representative, met with RIT students, from left, Thirno Diallo, Laura Alderfer, Amy Hughes, Lisa Chiffolo, Natasha Amadasun, Lindsay Demblowski and Shanyce Stewart as they prepared for their travels to Guatemala to work in area hospitals through help from RIT engineering alumni Mark Indovina (back, second right) and his daughter, Jennifer. 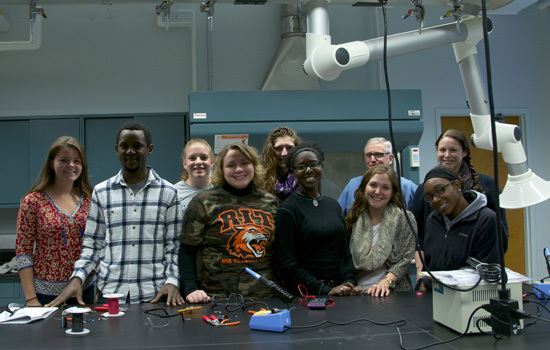 Biomedical engineering students from Rochester Institute of Technology will ring in the New Year in Guatemala working with the international nonprofit organization Engineering World Health. They will work in three of Guatemala’s largest hospitals repairing much-needed medical equipment during this winter’s intersession break from Dec. 28 through Jan. 18. Engineering World Health brings together engineers from around the world to help in medical institutions and to improve healthcare delivery in the developing world. It also provides an opportunity for student-volunteers to get a global perspective about how engineering can have a beneficial effect in resource-poor communities. 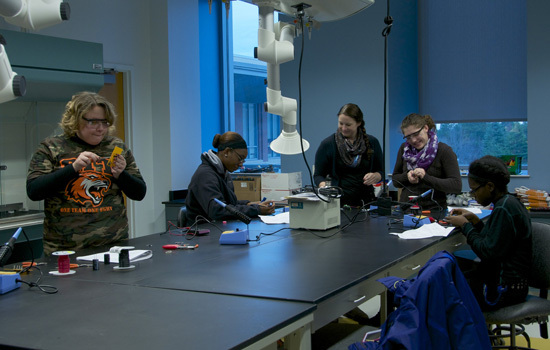 But, before heading south, the students participated in hands-on training through weekly workshops supported by the Department of Biomedical Engineering in RIT’s Kate Gleason College of Engineering. During these workshops, students applied engineering skills to get a better understanding of medical equipment they were likely to find onsite. In some instances, the equipment is donated, arrives without user manuals, or the manuals are in different languages. “Trips such as this can be life-changing experiences for the students and challenge them to think creatively when trying to solve real-world problems,” said Iris Asllani, faculty adviser to RIT’s Engineering World Health student organization and associate professor of biomedical engineering. She organized the weekly trainings in her lab working closely with three engineering alumni: Jennifer Indovina ’06, ’07 (electrical engineering, MBA), her father, Mark Indovina ’82, ’87 (electrical engineering) and Carlos Barrios ’06 (electrical engineering). The three are part of one of the area’s top technology firms, Tenrehte Technologies Inc. The students learned to use oscilloscopes, power supplies and voltmeters to troubleshoot circuits, to check work and detect failures for repair. Several of the students have traveled internationally prior to this trip to support different advocacy efforts. Lindsay Demblowski spent the summer of 2013 in Rwanda as part of Engineering World Health’s Summer Institute. This past summer, Laura Alderfer spent several months working in Rwanda with the Children Might Foundation and blogged about her experiences. Students traveling include Demblowski, Alderfer, Natasha Amadasum, Amy Hughes, Shanyce Stewart, Thirno Diallo and Lisa Chiffolo. Membership in the campus chapter of Engineering World Health is open to all students, not just biomedical engineering students because anyone can make a contribution to engineering health around the world, said Demblowski. For more information about the chapter’s work, this season’s travel or to provide funding assistance, contact her at lad8988@rit.edu.